In this article we will learn about some of the mostly used SQL Server queries every developer should know. These queries can be asked you as an Interview Question or they are handy for you in your day to day tasks. In this SQL Server query we will learn How to create table in SQL Server. In this query we will Create SQL Server table with primary key. In this SQL Server query we will learn about How to insert values into Sql Server table. In this Sql query we will learn How to Insert Multiple Rows in a Single SQL Query. This query is very important and generally asked in .Net Interview questions. In this Sql query we will update single record from a table. In this Sql query we will update all records within a table. In this Sql query we will delete single record from a table. In this Sql query we will delete all records from a table. In this Sql query we will select all columns from a table. In this Sql query we will select specific columns from a table. A view is a virtual table created based on the result generated by SQL statement. Fields in a view are directly related to one of more tables from database. In this query we will learn about How to create stored procedure in Sql Server. 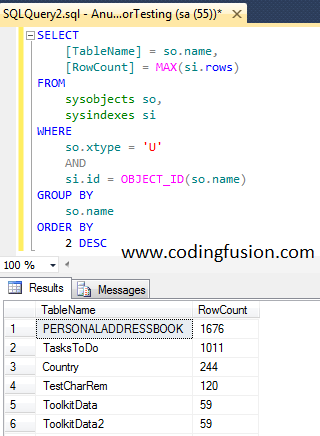 In this query we will learn about How to get all column names from Sql Server table. In this query we will learn about How to search any column name from Sql Server database. This query will look out for matching column names in database. In this query we will learn about How to get names of all user created tables in Sql Server. In this query we will learn about How to get names of all views in Sql Server. In this query we will learn about How to get names of all stored procedure in Sql Server. In this query we will learn about How to fetch the row count for all tables in a SQL SERVER database. This query is very usefull when we want to know how many records are present in tables. In this query we will learn about How to get Comma Separated List of all columns in table. In this query we will learn about How to Generate ADO .net SqlCommand parameters in Sql Server. Fellows who have worked on asp .net webforms and ADO .net must know the pain of generating parameters for SqlCommand object for large tables. I have written this query to save my time and generate parameters on the fly. This is one of my favourate SQL Query. In this query we will learn about How to get list of all database names in Sql Server. In this query we will learn about How to Check default Language of SQL Server. In this query we will learn about How to Check SQL Server instance name. In this query we will learn about How to add new column to existing SQL Server table. In this query we will learn about How to remove column from SQL Server Table. In this query we will learn about How to check if any column contains only NULL values in SQL Server Table. In this query we will learn about How to get list of tables without primary key in SQL Server. 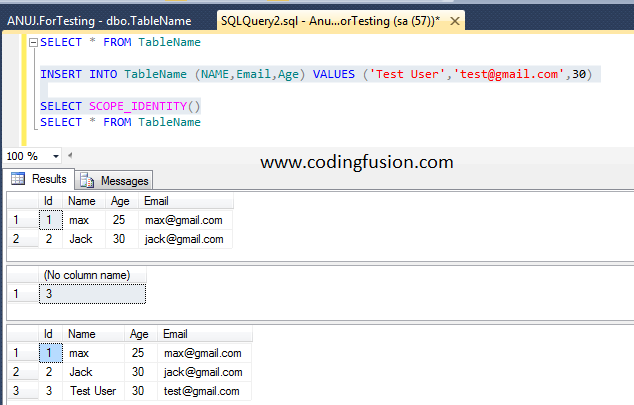 In this query we will learn about How to get list of tables without having identity column in SQL Server. In this query we will learn about How to get all month names with month number in SQL Server. I have used this query to bind my dropdownlist with month name and month number. In this query we will learn about How to get name of current month in SQL Server. In this query we will learn about How to get name of day in SQL Server. In this query we will learn about How to first date of current month in SQL Server. In this query we will learn about How to last date of current month in SQL Server. In this query we will learn about How to first date of previous month in SQL Server. In this query we will learn about How to last date of previous month in SQL Server. In this query we will learn about How to first date of current year in SQL Server. In this query we will learn about How to last date of current year in SQL Server. In this query we will learn about How to select date without time in SQL Server. In this query we will learn about How to select records within two dates in SQL Server. Note: Here Employee is my table name and CreatedOn is a name of date column used for filtering. 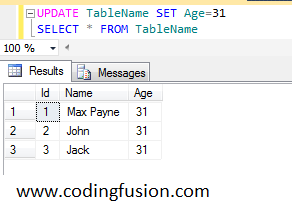 In this query we will learn about How to calculate age from birth date in SQL Server. In this query we will learn about How to get days between two dates in SQL Server. In this query we will learn about How to truncate all database tables using single query in SQL Server. Note: Please take proper backup before running this query. This query will remove all data from all tables in selected database. In this query we will learn about How to delete all rows from all tables in SQL Server which have foreign keys. In this query we will learn about How to drop all tables with single query in SQL Server. In this query we will learn about How to Reset identity seed after deleting records in SQL Server. Note:Make sure to delete all records before using this query. In this query we will learn about How to Select random rows from SQL Server table. In this query we will learn about How to swap values of two columns in SQL Server. In this query we will learn about How to rename database in SQL Server. In this query we will learn about How to rename Table in SQL Server. In this query we will learn about How to rename Table Column in SQL Server. In this query we will learn about How to check version of SQL Server. In this query we will learn about How to get list of system hard drives with available free space using SQL Server. 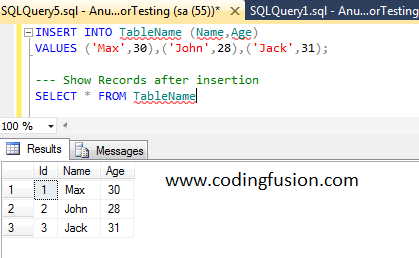 In this query we will learn about How to Id of latest inserted record in SQL Server. In this query we will learn about How to delete duplicate records in SQL Server. In this query we will learn about How to Display Text of Stored Procedure, Trigger, View in SQL Server. In this query we will learn about How to get list of Primary Key and Foreign Key for a particular table in SQL Server. In this query we will learn about How to get list of Primary Key and Foreign Key for a entire database in SQL Server. In this query we will learn about How to disable trigger in SQL Server. In this query we will learn about How to enable trigger in SQL Server. In this query we will learn about How to make database offline or online in SQL Server. Note: Make sure to select any other database while using this query. In this query we will learn about How to take backup of database using script in SQL Server. In this query we will learn about How to restore database using script in SQL Server. In this query we will learn about How to search string within a table in SQL Server. In this query we will learn about How to search string in all tables in SQL Server. 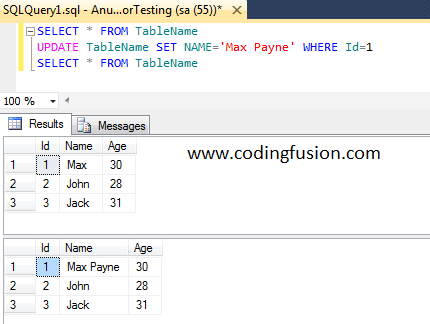 In this query we will learn about How to replace a string in a SQL Server Table Column. In this query we will learn about How to use Left outer join in SQL Server. In this query we will learn about How to use Right outer join in SQL Server. 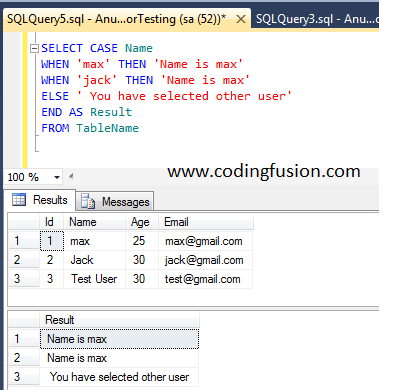 In this query we will learn about How to use Full outer join in SQL Server. In this query we will learn about How to use Inner join in SQL Server. In this query we will learn about How to use Cross join in SQL Server. In this query we will learn about How to use IF ELSE Statements in SQL Server. In this query we will learn about How to CASE Expression in SQL Server. In this query we will learn about How to select second highest salary in SQL Server. In this query we will learn about How to Implement paging in SQL Server. 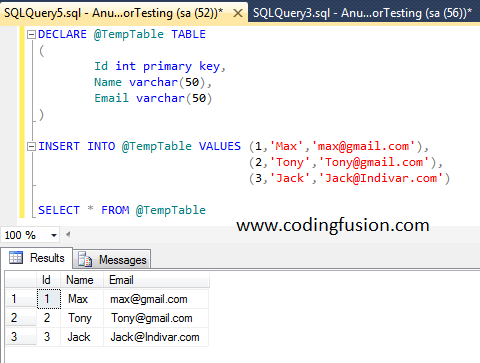 In this query we will learn about How to use temporary tables in SQL Server. In this query we will learn about How to delete duplicate rows in SQL Server. Note: Here 0 is the number-1 from where you want to start your auto increment. Suppose you wants to start auto increment your primary key value from 50 then you need to pass 49 in the above method. 1) How to remove connections from linkedin new design. 2) How to Change boot device priority or access BIOS in Sony VAIO Laptops?